Welcome to my Java Heap Tutorial. In previous tutorials, I covered how to print out trees in Java. You may want to look at that before continuing here, but it isn’t required. A Heap is kind of like a tree, but it is normally implemented as an array. There are 2 main rules for using a heap. 1. Every row is complete except for last row. 2. Parent keys are bigger then children. I will cover how to insert and remove items. I’ll show how an array is heaped. I’ll also cover how the Heap Sort works. Everything is covered in the video and code below. System.out.println("Store " + theHeap + " in root. Store "
Hello, There is any implementation of the heap or tree, or hash? 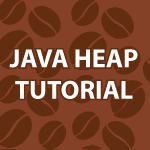 Hello, I have all of my algorithm tutorials here Java Algorithms Tutorial. I plan on coming back and covering advanced algorithms soon. when are you gonna start with the advanced tutorials? I’m not certain. I’m being asked for a bunch of different tutorials. normally when that happens I hold a vote. I have a question that when Heap Sort should be applied on or Where we should use it? Hello Abhishek, Many things can effect the speed of sorting : whether data tends to be partially sorted, the amount of data, whether data tends to be reverse sorted, etc. It is always best to pick your sorting algorithm based on the data. You may also find that it would help to test data dynamically and switch to different sorting algorithms. Thanks! Any particular reason why heaps are implemented using arrays?